Similar to many sport events such as the Olympics or the NFL, auto racing has become a brand-littered environment. With large race tracks to place banners and automobiles presenting ideal moving billboards to profile businesses or products, sponsorship is not only accepted but greatly appreciated. For a major auto racing series, presence of title sponsorship would not only provide a useful cash infusion but a way to sell a sporting organization's creditability. After supporting the North America's biggest open-wheel racing tour six years, serving as a major title sponsor for four seasons, designer apparel company IZOD was announced as ending its sponsorship commitment of the IndyCar Series with the conclusion of the ongoing 2013 season. Described as a change in circumstances that will leave IndyCar searching for a new title sponsor for 2014 and beyond, chief executive officer of Hulman & Co. Mike Miles said, "We are proud of our partnership with IZOD over the past six years and we're grateful to PVH Corp., owner of the IZOD brand, for its support, creativity and vision,". From the side of IZOD, the brand's parent company PVH Marketing Group said the discontinuation of sponsorship is a change in product focus. We would like to thank the IndyCar community, from the amazing fans, to the incredible drivers, to the entire series, for their partnership. We wish the series all the best and we look forward to finishing out the 2013 season with much success." said Executive Vice President of PVH Marketing Group Mike Kelly. IZOD began its marketing partnership as an official apparel provider in 2008. The company made a crucial move upgrading itself to title sponsor of the IndyCar Series for 2010. Ahead of the 2010 season, the series was still sorting itself out following years of acuminous battling between the Champ Car and the Indy Racing League. Through the 2010 season, a stabilized IZOD IndyCar Series began to prove inviting for sporting audiences. 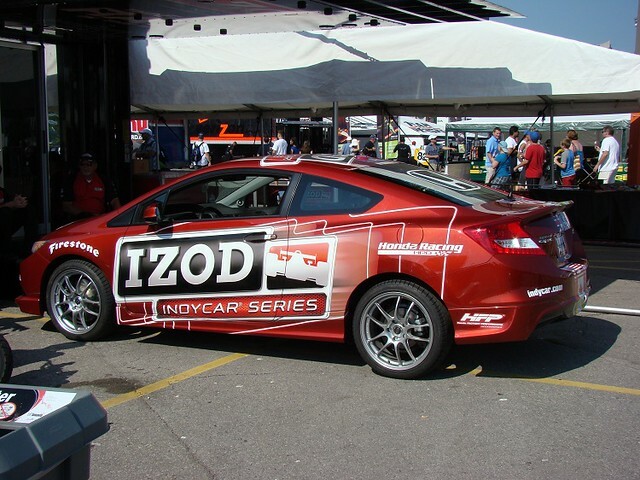 In addition to appearing along with the IndyCar name, IZOD also appeared on the side pods of competition cars fielded by Andretti Autosport and Team Penske. "We are proud of our partnership with IZOD over the past six years and we're grateful to PVH Corp., owner of the IZOD brand, for its support, creativity and vision," said Mark Miles as the IndyCar Series will be adopting a new identity next season either without a title sponsor or with a new name.